A triumph both as a gritty, emotional drama and as a uniquely inspirational sports film. Monique – aka “Mo” – (Elvire Emanuelle) is a feisty teen girl in the public system, getting moved from foster home to foster home and getting into trouble while biding her time until her incarcerated father (Yahya Abdul-Mateen II) can get out of jail, believing she’ll get to live with him once they are once again reunited. Her world is turned upside down when she and her friend Omari (Jharrel Jerome) discover that her dad has already been released from prison and is doing janitorial work; he didn’t even bother trying to find her. She confronts him in an attempt for the happy reunion she’s dreamt of, but he doesn’t want to deal with the baggage that comes with being a father. Attempting to find anything for them to bond over, she decides to follow in her dad’s footsteps by going out for the boy’s wrestling team. Her plan falls into place when she beats Omari to earn a spot and her father starts training her. Seeing her natural athletic abilities, he comes up with a plan to make some fast money: get his daughter to fight in illegal all-female MMA-style fights. Wanting to make him proud, Mo reluctantly agrees and her life gets exceedingly complicated as she tries to balance wrestling and MMA styles, friendships, and relationships with her dad and foster mother (Kim Ramirez). 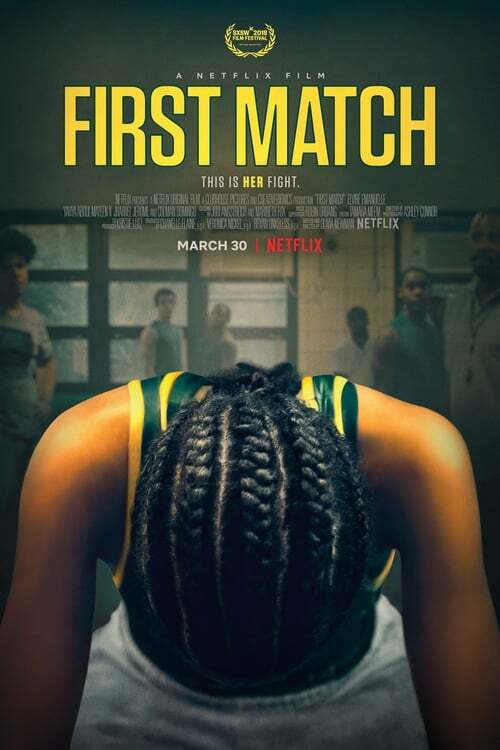 First Match is a triumph both as a gritty, emotional drama and as a unique sports film. First time feature writer/director Olivia Newman does a fantastic job with a compelling original story that packs more emotional punch than any Netflix Original Film we’ve seen before, turning her award-winning 2010 short film into a breakout feature. Cinematographer Ashley Conner does a fantastic job and plays well with light, and editor Tamara Meem rounds out the team of female powerhouses (also including producers Chanelle Elaine and Veronica Nickel who co-produced academy award winner Moonlight). The film plays with themes of nature vs nurture and overcoming your upbringing to be your own person. It also deals with making tough choices when the past haunts your present in order to move into a brighter future. It’s a story of hope, dedication, and rising above your situation. A lot of heartfelt themes weave their way through this 102-minute piece. Performances were magnificent all around. Newcomer Elvire Emanuelle gives a breakout performance showing many sides to the character of Mo. The takes us on the character’s emotional rollercoaster as she struggles with the tug-of-war her dual life plays with her. This young actress is someone to look out for! Yahya Abdul-Mateen II (who will be playing the lead villain in the upcoming Aquaman movie) also gave a great performance, even if the character often felt single-note in his actions and reactions – but Yahya played it well. The secondary actors all did their jobs well in rounding out the world Mo is forced to live in, which she strives to overcome and rise above. Will First Match win any major awards? It’s hard to say this early in the year, but it’s definitely on par with beloved movies such as Finding Forrester and Save the Last Dance. Who knows, people could very well be calling it the next Million Dollar Baby. Regardless, it’s a well-made film that feels raw enough to strike chords with audiences and is definitely a must-watch win for Netflix’s growing stable of original films.